By now you might have guessed that when it comes to picnics there’s not much that doesn’t float my boat, so to speak. Whilst not being able to nail the reason down to one specific facet, I can tell you why hosting a potluck picnic encapsulates so many of these affections. Potluck gatherings inspire creativity, individuality and give a sense of personality that can all be expressed by what you are bringing to the table. At the same time it promotes strong bonds through sharing and a sense of community. It’s where cultures clash but in a way which educates and encourages you to diversify your tastes. To accept (or reject) new ideas, new textures, new smells. There are no rights and there are no wrongs. Your dish might not prove to be the most popular on the day but you have put yourself out there, tried something maybe a little different and built upon your knowledge base whilst at the same time been able to enjoy a great day with similar minded people. The satisfaction that comes from sharing these moments with your peers can only be bettered by the fact that you have managed to enjoy the whole aspect of a fully-fledged picnic whilst having to put your whole time and effort into the one solitary dish. What follows are some of my personal favorite picnic potluck ideas. They are tailored specifically towards the picnic setting and there will be a follow up post in regards to BBQ potluck ideas at some point where dishes tend to vary differently. For now though, I hope you enjoy reading on and if you would like to join in the discussion there is, as always, the comment section below. As with anything in life, sometimes the best ideas are the simplest ones and I think this translates perfectly when talking about potlucks. There is nothing better than taking one main ingredient and letting it be the star of the show. It might sound unspectacular but if executed correctly it can turn your dish into the most talked about dish at the potluck. Glazed hams – Hands down my favorite thing to bring to a potluck. Hams are relatively inexpensive but because of its size will feed even the largest of potluck gatherings. They can be prepared well in advance meaning little to no stress. Everyone has probably enjoyed a honey glazed ham in their time so I like to vary it with a pineapple or orange glaze or if I’m feeling especially decadent, a bourbon based glaze. The secret of a good glazed ham of course is a crispy glaze. Achieve this and you will be the talk of the potluck. Gazpacho – Gazpacho is one of the potluck recipes that takes others by surprise. On the face of it cold tomato soup shouldn’t be that appealing but one taste of this intense Spanish offering will soon have you changing your mind. There are other ingredients that go into the making of Gazpacho but make no mistake that any authentic version will predominantly smash you in the kisser with the overriding taste of tomato. It is best to keep it in a flask and when served in individual portions, Gazpacho can prove to be a great addition to the potluck as it can double up as a quick refreshing drink. Vegetable tots – Tots are a delicious offering that you can add to your list of potluck recipes. What makes them even better is you can use most vegetables to make them out of. I’m extremely fond of broccoli tots but equally good are cauliflower, carrots, sweet potato and zucchini. You can find a basic recipe here but I like to add a little spice whether it be in the form of a peppered cheese, chili flakes or some hot sauce. Oh, and by the way, these are awesome when eaten cold. The one thing you often find missing from a potluck is a good quality salad. In some people’s mind a salad can represent a boring, safe option and when you are only bringing one dish to the party there’s a sense you want to bring your best effort, to perhaps show off a little bit. A good salad can distinguish you from the crowd however. 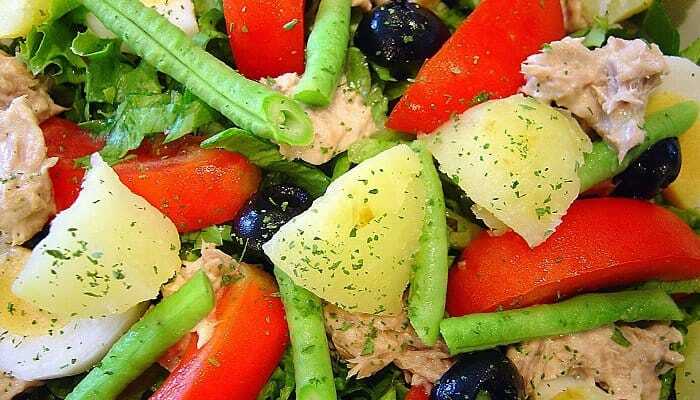 Whilst you will undoubtedly be inundated with casseroles, wings and bakes, the salad, as well as providing a healthier option, can elevate your reputation due to providing some much needed variety. Whether it’s a simple green salad that can be enjoyed on the side of ones plate or in a bun with some meat or a spicy bean salad that provides a filling, vegetarian option, there will always be a place for a salad at a potluck. Salads are notoriously easy to make and can be transported with the minimum of fuss. Everyone has their own favorite so I will not keep you any longer but please check out our post on Thai picnics for a great suggestion for a Thai beef salad. We’ve all been in the situation where either you get a last minute invite to a potluck or your best laid plans have fallen through for one reason or another and you need a dish that you can whip up quickly to save the day. You’re left rummaging through the cupboards, scrambling for ideas that will not only help you save face but will potentially be equal to any other dish that will be served. Cheese balls – Extremely easy to make, no cooking needed and readily available ingredients make cheese balls a great option for those who are up against the clock. Instead of giving one specific recipe, because of the theme of this section I will direct you to this page which shows a whole range of recipes for cheese balls. Hopefully you are able to find something here that matches the contents of your refrigerator. Spanish tortilla – An idea already shared in our Spanish picnics post. Tortillas deliver on the requirements needed to be in this section by containing ingredients that should be freely available to you. They take hardly any time to make and unlike other options like devilled eggs for example, they look like a bit of time and effort has been taken to produce the dish. Candied pecans – Nuts are a food that I think should be at most gatherings, let alone potlucks. You can’t come to a shindig with just a bag of nuts however. When you turn said nuts into super duper candied versions though it looks like there has been some thought and effort put into your offering. Made with just the most basic of ingredients, candied pecans will allow you to raid your cupboards and produce a worthwhile dish for just a few bucks. You now have some basic ideas on the food that you could potentially bring along to the potluck but there are still some other things to consider. Because many people have the same ideas when bringing along their contributions some things are almost always forgot so below you can find some of the more common things that are often missing from a potluck. You don’t have to provide everything yourself but with a bit of planning and communication you can make sure you have all you need to turn a good day into a great day. Drinks – One of my pet hates is when people bring drink as their contribution. This is not a legitimate offering in my view but maybe that’s just me. It’s best to plan ahead and make sure you don’t end up with 15 bottles of cola and one orange juice. If you’re bringing alcohol make sure you’re not clashing either and bring suitable mixers. Ice – Constantly overlooked but probably the most needed item on those hot, hot days. It’s even better if you can provide a picnic cooler as well but any contribution to the ice stores is always warmly appreciated. Flatware – There’s only so much flatware the host will have available and that’s probably not going to be enough for the larger gatherings. I would suggest using disposable flatware if you are worried about your regular stuff going missing elsewise bring items that are clearly distinguishable as your own. Accessories – Games, corkscrews, pop up shades. Anything really that you might have that you would normally take to your own picnic that you think might be of use for the potluck.